So what prompted me to have The Tan Family coat of arms created? Since young I have always been very fascinated with country/family coat of arms. I thought it was incredibly meaningful that each and every component of the coat of arms was a symbol of some bigger or deeper meaning. That even the colour had meaning, and how the coat of arms was sectioned and divided meant something. I was always very intrigued by it and read about it a lot. I often wished that we had our own family coat of arms. I recall, even back in the late 1990s, I went so far as to search online for coat of arms under the last names of Tan (my dad's surname) and Lee (my mum's surname). A search on Google just done today reveals the above. Only the first one is a Tan (apparently of German ancestry!) and the other four are Lee - from the UK and other parts of Europe. There are online shops (known as "heraldic bucket shops") selling stuff with all these coat of arms emblems too. Certainly, I knew these are not part of my family history, I just searched for the fun of it. In my teens, when I went a bit crazy on this topic and read whatever I could find on coat of arms and flags etc, I also read that families in medieval times had family coat of arms that would be combined when the families married. I thought it was incredibly romantic and symbolic to marry the man of your dreams and create your own family emblem that symbolised your union and your new family. Thus, it was a childhood dream, a romantic dream, that one day, I would have my own coat of arms for my family. While googling to get images for this blogpost, guess what I came across? 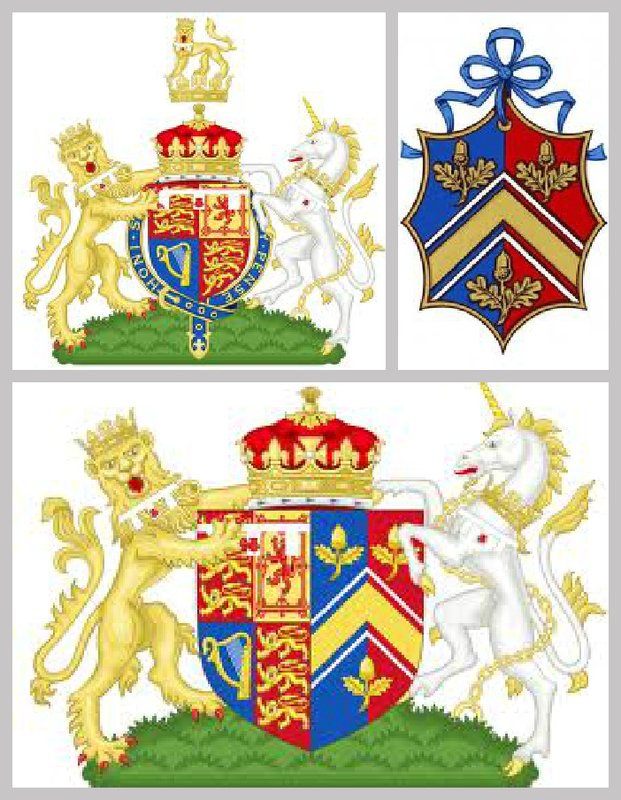 Prince William and his wife Kate Middleton's coat of arms! Apparently, usually only nobles or royalty had coat of arms. Kate Middleton, being a commoner, was not required to have a family coat of arms. But in the lead up to her marriage with Prince William, Kate's father had a heraldic design commissioned as well. So yeah, that was the tipping point. If Hogwarts had a coat of arms, I want one too. Hah! :p I'm glad I did it though. What started out as a whim on a fancy, turned out into a very meaningful exercise. May this be the start of a meaningful tradition for the Tan Family. When the kids each turn 18 years old, I shall have them all design their own personal coat of arms. And when they get married and have their own family, they can design their own family coat of arms. Yes, I'm having grandmother dreams already! Plan ahead, ya know! Interesting sharing:), and very meaningful thought of having your own coat of arms. Didn't Steve Job say it, "Dream bigger"? You will success:)! It's always so nice to have dreams come true, no matter how small it seems - for you, it is the coat of arms for the family. I like the significance that went behind the design of your coat of arms and that makes all the more unique to have it featured on your blog. How about having it printed in b/w in letterheads and envelopes next?